Dental crowns and bridges are custom-made and barely noticeable. They should help correct any bite issues you may have, which may improve your speech and chewing ability. When your teeth are heavily damaged or decayed, they may be too weak to survive with simply a filling. By placing a crown, your tooth may be given a new lease on life. Even when a single tooth is lost, a denture may not be required, as a bridge can be made which spans the gap. Dental crowns and bridges, along with diligent oral care and regular dental check ups may last for 5-15 years or more. The ultimate timeframe depends upon your overall oral health and hygiene habits. 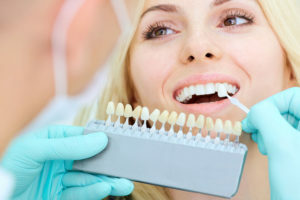 Please discuss all of your options with our dentist to develop a unique treatment plan for you. Crowns are used to strengthen and restore a tooth to its full functionality and normal appearance. A crown is a tooth-shaped cover or “cap” for a damaged tooth that surrounds the entire visible portion of a tooth – from top of tooth to the gum line. There are basically five types of crowns: metal, gold, porcelain fused to metal (PFM), ceramic, resin and porcelain. Each has advantages and disadvantages, according to your specific situation. Be sure to discuss this thoroughly with our dentist. A recent technology, CAD/CAM technology (computer-aided design/manufacturing technology) has evolved to display a 3-D picture of the teeth. A restoration is then created through milling of a ceramic block. If this technology is located in the dental office (chair-side CAD/CAM), there will be no need for a temporary crown or return visit for the final cementing of your permanent crown. If you experience no complications this procedure can be performed in two visits. 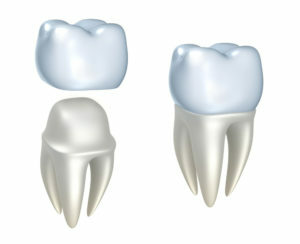 The first visit is for a temporary crown and the second one is to cement the permanent crown in place. The first appointment will include X-Rays and tooth preparation for the crown. This entails reducing the size of the original tooth so that a crown will fit on top. An impression of that tooth will be made and sent to a lab. They will create your custom designed crown that will be cemented in place at your second appointment. Meanwhile a temporary crown will be applied. Avoid sticky, chewy foods such as chewing gum or caramel, which have the potential of grabbing and pulling off the crown. Minimize the use of the side of your mouth with the temporary crown. Shift the bulk of your chewing to the other side of your mouth. Avoid chewing hard foods such as raw vegetables, which could dislodge or break the crown. While a crowned tooth does not require any special care, do remember that simply because a tooth is crowned does not mean the underlying tooth is protected from decay or gum disease. Therefore, continue to follow good oral hygiene practices, including brushing your teeth at least twice a day and flossing once a day-especially around the crown area where the gum meets the tooth. Do not chew ice cubes! Do not tear open packages with your teeth. Use scissors! Costs vary depending on what part of the country you live in and on the type of crown selected. In other words, porcelain crowns are typically more expensive than gold crowns, which are typically more expensive than porcelain-fused-to-metal crowns. Generally, crowns can range in cost from $800 to $1,500. 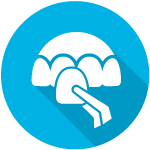 The cost of crowns is not generally fully covered by insurance. To be certain, check with your specific dental insurance company. A bridge may be more appropriate than an implant if you have certain medical conditions preventing oral surgery. A bridge may be recommended if you’re missing one or more teeth. Gaps left by missing teeth eventually cause the remaining teeth to rotate or shift into the empty spaces, resulting in a bad bite. The imbalance caused by missing teeth can also lead to other painful disorders. Bridges are sometimes referred to as fixed partial dentures, because they are semi-permanent and are bonded to existing teeth or implants, which support them. Some bridges are removable and can be cleaned by the wearer; others need to be removed by a dentist. This procedure requires two or more appointments. At the first appointment your teeth are prepared to make room for the supporting crowns, to which the false tooth will be attached. An impression (or, mold) is then taken and sent to the laboratory, and a plastic temporary bridge will be fitted for you until the permanent one is ready. Laboratory production takes approximately 2 weeks. At the second visit, the temporary bridge is removed and the final bridge is permanently cemented into place. Just call us and we will be happy to answer any questions you may have regarding crowns or bridges.